AverageBro: Further Proof That Barry Took Rebb'n Al's Soundbyte Seminar. 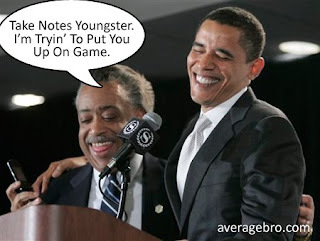 Further Proof That Barry Took Rebb'n Al's Soundbyte Seminar. Months ago, after Barry locked up the Democratic nomination, I gave him some unsolicited advice to sharpen up his game for the Fall election season. Among my many nuggets of wisdom was the suggestion that Barry tighten up his rhetoric by attending one of Rebb'n Al Sharpton's patented weekend Soundbyte Seminars™. Seriously, for all the inspirational quality of his major speeches, on the stump, Barry is plain vanilla more times than not. With the polls tightening, and folks beginning to finally focus on the issues, one way to guarantee that your message resonates on the streets (aka: the 6 o'clock news) is to come up with snappy retorts that will get you continuous 15 second loops. Sharpton's dismal 04' campaign never amounted to much in terms of votes, but at least the guy was memorable. You may not personally like him. You can call him lots of things: an opportunist, a rabble rouser, a huckster, a shakedown artist. But you can't call him late for dinner dull. So, Barry finally paid the $599 late registration fee, bought Al an extra large order of rib tips, and picked his brain sometime quietly in late August. I'd call it money well spent, because he's clearly putting the lessons to work. Not bad. Snappy and authentic, but not too sarcastic. I'm sure McCain and Co. will start crying about ageism or some such nonsense. I already see the ad being edited in Pinnacle Studio now. Question: Do you think Obama's investment in Rebb'n Al's Soundbyte Seminar is paying dividends? And just in case you're wondering, I like the guy. Pause. Not a real thing. That's satire. Don't go startin' no rumors.